RESCUE: Pippa Update! 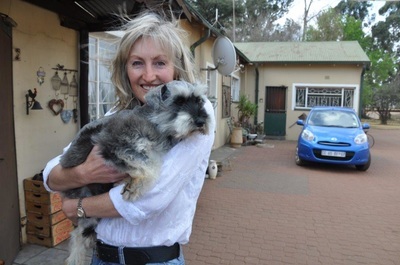 On the 3rd September 2015 "Yvonne" was adopted! She has been given a new life and a new name of Pippa to signify her new life as a princess! 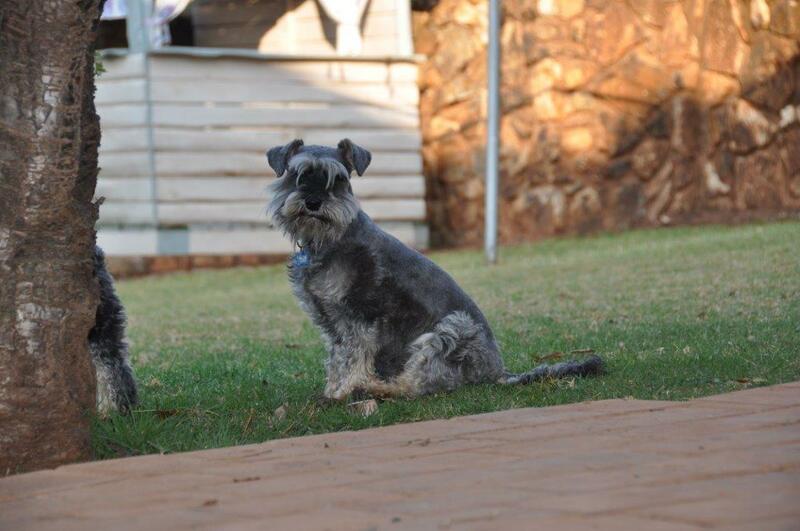 She was the one of the second batch of 11 Roodewal contract breeder schnauzers surrendered to us to go to a home. (She was the one in the photo cowering in the kennel!). She was an ex Roodewal Kennel contract breeding mom and had only ever lived outside in the cold and rain! She will now sleep inside and experience love and tummy tickles instead of living in a pen outside in the cold and rain with little human companionship just making babies! Thursday Day 1: “Rescue Yvonne" is officially home. She has a new name to go with her home: Pippa. She is very, very scared but has found a quiet cushion under the table, next to the fire and who can blame her for not moving?!? Friday Day 2 at home: Princess Pippa has made some progress from arrival yesterday. She now lies looking into the kitchen and peeps at us from under her eyebrows. Thank heavens for zoom lenses! But if we get too close she shuts down again. Slowly, slowly....hour by hour...we'll get there. Sunday Day 4 at home: This morning Pippa went exploring the entire garden under the watchful eye of Storm and Zoe. 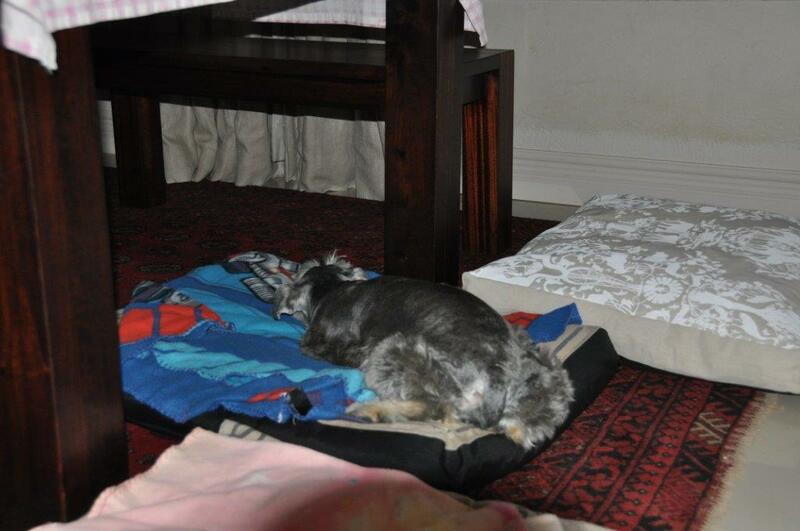 During the tour she got frightened by a loud noise and came dashing into the house and under the table. The kitchen is her "safe" place!! Yippee! 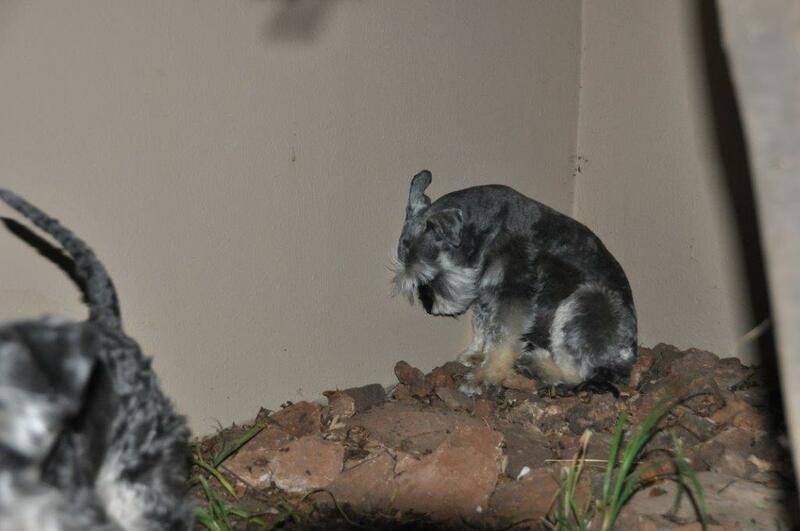 Monday Day 5: When I think back to the first picture I ever saw of our Pippa - dejected and cowering in the back of an igloo - and then I look at her today, after just a few days with us I am so thankful for those big hearted people who care enough to get involved and to rescue dogs. Thank you! From all the Zerwicks and from Pippa. Today she is a dog that has choices...she may choose to be outside, or she may choose a warm cushion inside and she may choose not to be touched (but how I long for a day when she chooses to come for a loving touch!) . Thank you for giving her a second chance. And, as an aside, can you believe this beautiful girl is the same one in the initial photographs? She is a salt 'n pepper stunner! Tuesday Day 6: I find myself looking for the smallest signs that Pippa is adapting to her new life and then throwing her little treats when she has tried something new. I am beginning to feel like a seal handler at the aquarium tossing fishes onto the pool edge so the seals can fetch them! She is still so skittish and to get close enough to touch her is impossible. Boy can she slink away at speed! Bit by bit she is responding to my voice though and today I called her from the garden and she came! Such a little step but it feels like a giant leap. 1 Week with Pippa. This week has truly gone by as fast as the Jozi Express! And it has had as many ups and downs too. From the initial petrified little dog who sat facing into a corner to a lively, inquisitive fully fledged family member with her own personality just starting to show itself. (Can you believe she pulled her nose up at the gem squash on her dinner tonight! Just like a child!) We are still only on talking terms...me cooing endearments to her and her pretending I am not there...but there is hope because she tolerates hubby and allows him to cover her with a blanket and give her a cuddle in the evening when they are tucked up for the night. From this we guess that the person who hurt her was a woman. I have my work cut out for me and I relish the challenge. Watching her come out of her shell has been so rewarding and we are looking forward to what the next week brings. PS: NO zoom lens on the photo! How’s that for progress?!? And 3. I now have a "carrot" to coax her close enough to get a lead on. To top that she showed me just how one digs a hole with the maximum mess and fun and then left Storm's bunny as a decoy just in case she should get in trouble! Bring it on, Pippa, we are ready and waiting with the cuddles! Week 2: In the lap of luxury. Pippa, Zoe and Storm having a quick power nap to recharge the batteries after a busy morning barking at the staff (they were late!) and patrolling their turf. Pippa has truly become one of the pack and is loving her new found freedom - some evenings it is hard to get her in and to bed. We still haven't got onto touching terms even if I offer the lead for a walk with the others she just can't bring herself to come within touching distance, but oh! The look of longing in her eyes when we leave through the gate! On the upside she does come when called and I even get tail wags when I praise her. Progress is measured in small steps at the moment and just when it is tempting to think we are not going forward and I need to push her a little she does a another new thing (like jumping up and lying on my bed while I work in the study alongside) and I realise we must let her dictate the pace she is comfortable with. Unfortunately tomorrow is not going to be a nice day for her: we need to go to the vet and have her stitches out. I have made a special arrangement with the vet and we are hoping she copes. Spare us a thought. We have made it to the vet and back safely and relatively trauma free although I think I need a double shot of espresso. Whew! Poor Pippa was terrified and totally shut down while we were there (I don't think the vet has ever had such an easy patient. She didn't even move a muscle). Once we got into the car she looked around as if to say "That's it?!?!" And then when we got home and her brother and sister made a huge fuss over her, smelling her from nose to tail, she perked up and even gave them a tentative tail wag. 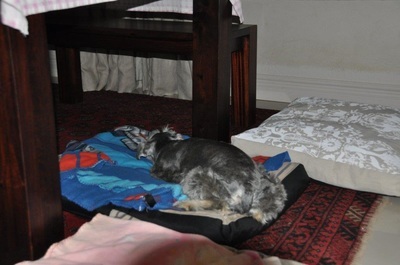 Now Storm is lying alongside her in the kitchen to give her a little comfort so I anticipate all will be well within a short time. I am astounded. I have barely finished typing this and here comes Pips to lie alongside me in my study. That’s my awesome, brave, resilient Princess Pippa!! Week 3: Time flies, doesn’t it? Hard to believe we have had Pippa home for 3 weeks already. So much has changed for the positive for her and yet it feels as if so much has stayed the same for us. She loves her new brother and sister as you can see in the photo and is fully a member of the pack. She remains just on the fringes of the human family, though, and still doesn’t allow touches or cuddles. It is important to me that we respect her pace and so I don’t push her, but once or twice she has had a head rubbed by someone in passing and has not jumped up and slunk away so I live in hope that soon she will allow me to give her a “love”. At the moment she gets lots of voice strokes and she responds so well to them. In the mornings when I come down into the kitchen, where the dogs sleep, she dances around in the distance and barks at me wagging her tail. Better than my best treat: a cappuccino served in bed by He-who-pays-the-bills! How I love my morning greeting!